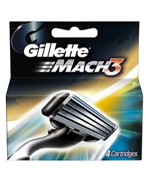 Buy Gillette Mach3 Cartridges 4. Delivers more efficient shave with fewer total strokes & less irritation. Gillette Mach3 Cartridges 4 Enhanced Lubrastrip with Aloe Vera that provides more lubrication to help the blades glide easily over the skin. An elastomeric handle provides a secure grip and great control to help soothe nicks and cuts. • Three progressively aligned blades deliver less pressure on the skin, while each blade shaves the hair progressively closer. • This delivers a more efficient shave with fewer total strokes and less irritation.